Burberry’s New Eye Color Creams ($30; sephora.com) are lightweight cream to powder shadows with a soft, cushion-y texture. The formula is quick and easy to blend and comes with a small, flat shader brush for application. I’m not a big fan of the brush since its very flat, thin and not very useful for this kind of texture. 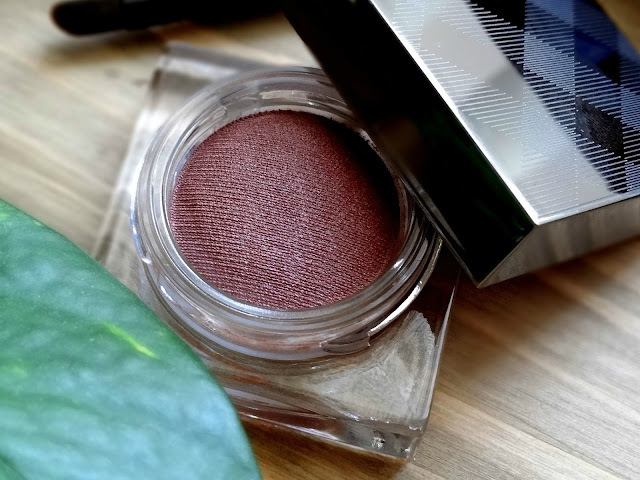 I have been staying away from Burberry’s cream formulas for a while after trying out a few disasters, but this one is quite a nice texture for a cream eyeshadow that I’ve been reaching out to quite a bit. Pink Heather is a very neutral brown with hints of mauve. There’s not too much shimmer, but a subtle glow that adds a little bit of dimension, without which the color can look totally flat. The texture is very soft, there’s very less fallout and blends easily with fingers or a fluffy brush. To pack on more color though, I would recommend a good flat shader brush. The color payoff is not the most intense, but if you like subtle washes of color and neutrals in general, the range is definitely one to check out. I can’t speak for the other shades, but Pink Heather definitely needs a good primer for longevity. It tends to vanish onto my lids after a good 4 hours or so. While not the most long lasting or extremely pigmented, I still like the ease of use and the natural looking wash of color I get from this one. The texture is quite nice too and very soft without the glitter overload! I’ll definitely be checking out another shade or two soon. Wearing the Burberry Eye Colour Cream in Pink Heather without primer. So pretty! This would make a lovely crease shade too. I will give them another look at a Nordstrom soon, hoping these are not limited edition!